Audit compliance is one of the most important tasks that needs to be undertaken by companies at the beginning of a new fiscal year. In addition to ensuring taxes and duties are paid and accurate, it helps companies detect any irregularities and allows them to take appropriate action. However, the process can be daunting for companies operating in a foreign country. 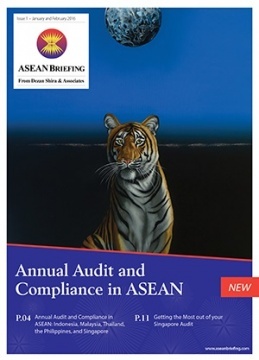 This process can be even more complex when doing business in the evolving markets of emerging ASEAN, despite laudable steps towards regulatory harmonization. As the region becomes more attractive, it is important for all companies to be informed on the latest updates and regulations to remain in compliance. With multiple years of experience operating regionally, the qualified professionals at Dezan Shira and Associates have assisted a wide number of clients to meet their accounting and compliance needs in ASEAN. We hope you help us become part of your Asian success story, and wish you and your business interests a profitable year ahead.